Hello Everyone! Happy Monday. I apologize for the delayed post, but things were very busy at Old Stuff, Inc. last Friday, and I kept getting pulled away from the computer. Without any further ado, on with the show (and tell). Today’s Fantasy comes to us right out of the pages of the A.J.’s (Andrew Jackson Downing and Alexander Jackson Davis). Both of the A.J.’s were big proponents of the Gothic Revival style. A.J. Downing, who is regarded as the father of modern Landscape Architecture in addition to being a prominent Gothic Revival architect, felt that every American has the right to a good, solid and attractive home, and therefore, proceeded to design three types of homes: Villas, Cottages and Farm Houses. These three dwelling archetypes, which appeared in his book, Cottage Residences, were intended to offer a home that could meet anyone’s needs. Villas for the wealthy, Cottages for working class townsfolk and Farmhouses for farmers. Downing also though that beautiful home design effected the morals and civility of the homeowner, and that beautiful homes would lead to a better citizenry, which would lead to a better America. A.J. Davis was a noted architect at the time and together the two were practically responsible for the Gothic Revival Movement in America. Today’s house is Roseland Cottage in Woodstock, Connecticut, which is owned and operated by Historic New England. It looks so idyllic it might as well be a lithograph plucked from the pages of Cottage Residences. Combine that with its Downing-principled landscape and Roseland Cottage is a dream home for all, whether you’re a steam punk enthusiast, a Poe lover or an Anglophile (and many other categories in between). Roseland Cottage was built in 1846 as a summer cottage for Henry and Lucy Bowen. Henry Bowen, a native son of Woodstock, made his fortunes in New York City as a purveyor of silks, ribbons, lace and other fancy goods. Once he had established himself in business, married, and started a family, Bowen sought to create a retreat from the summer heat, while also renewing his ties to his childhood home. 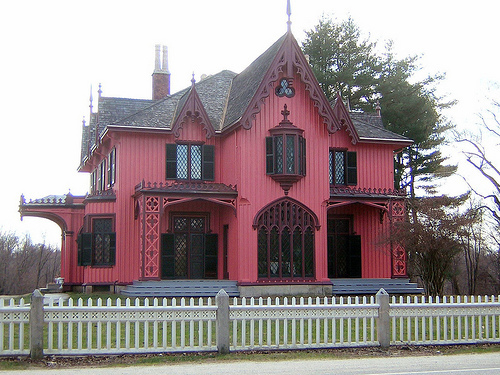 Bowen commissioned English-born architect Joseph C. Wells to create the cottage and landscape, and Wells gave him this Gothic Revival style masterpiece, complete with a naturalistic landscape straight from Downing’s books, and a boxwood parterre garden the likes of which would be more commonly found on a French estate. The house and grounds were enjoyed by three generations of the Bowen family before Historic New England bought it from them, in order to preserve this 19th century treasure. Much more info can be found at Historic New England’s website, along with more photos.